Quilting is a lifelong learning process; even if you've been making patterns for years, that doesn't mean there still isn't more to learn. Both beginner and experienced quilters can improve their skills with our Learn How to Quilt with Our 5 Best Quilting Tutorials collection. You can get some excellent tips on how to cut fabric, add quilt binding, and finish your quilt like a pro. Get tips and techniques from some of our favorite designers who are helping quilters reach their true potential and make all of their free quilt patterns the best they can be. If you're looking for even more tips, tricks, and techniques for all things quilting, don't worry, we've got even more! Just download your free copy of 17 Quilting Tutorials: Quilting for Beginners and Top Tips for How to Quilt and you can access even more advice from top bloggers about all things quilting. Start from buying your fabric and follow our eBook all the way to the finishing touches on your pattern. We've included quilting tutorials for all skill levels, so there's something for everyone. 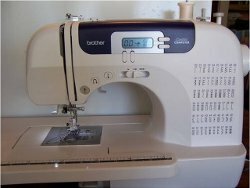 Getting to Know Your Sewing Machine (shown) - When discussing quilting for beginners, it's essential to mention the sewing machine. In this excellent tutorial, quilters are not only given instruction on how to insert a bobbin correctly, but also how to adjust speeds, choose stitches, and more. Squaring Your Half Square Triangles - Another important step in the quilting is cutting. It seems so basic, but a few miscalculations or bad cuts can throw off a quilt entirely. One great way to get practice is by making half square triangles for quilt blocks. 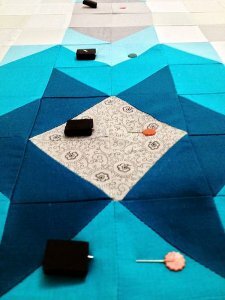 Introduction to Free Motion Quilting - For quilters who are a bit more advanced and are looking for some technical guidance, this quilting tutorial on free motion quilting patterns is perfect. Not only does it provide some great tips for how to keep everything smooth and clean, but also little practice maneauvers you can do to improve your technique. Pin Basting Your Quilt Layers (shown) - Working towards finishing a quilt can be just as overwhelming with so many different approaches. You can find what works best for you with quilting tutorials like this one on a popular techinique for holding the layers of your quilt together. Single Fold Binding Tutorial - Our eBook on quilting for beginners also covers the basics of binding a quilt and adding borders as a finishing touch. Beginners can start with this basic approach that's easy to rely on when you're in need of some nice finishing, and advanced quilters can move onto more complicated folds. There's nothing better than having the confidence to make a pattern, and the best way to build your confidence is through learning. Give yourself a solid foundation and grow using the quilting tutorials included in the 17 Quilting Tutorials: Quilting for Beginners and Top Tips for How to Quilt eBook.